I can hear a lawnmower in the distance, the first in weeks because of the drought. Someone must be mowing weeds since they’re the only things growing. It’s not a loud, harsh sound because it’s so far off. It’s a dreamy, mesmerizing hum that takes me back to our first year here and how I inadvertently created more work than we bargained for. We live in the country, surrounded by farm fields. It wasn’t always so. Dale and I grew up in cities and moved to the suburbs when we married. Many years later we tired of having neighbors so close that they knew what we were going to do before we did. We wanted space… crickets instead of cars…Carl Sagan’s “billions and billions of stars” overhead…friendly but somewhat remote neighbors. We found what we were looking for: a single story cottage-y type home, with a room full of light for my studio, on a little over an acre of practically naked land. Dale’s only reservation was the amount of lawn he’d have to mow. But I assured him I’d fix that by planting trees and flowering shrubs to create a small thicket on the back third of the property. He agreed with the plan. I paid the Farm Bureau $10 for 100 native saplings, specifically chosen to create a wildlife refuge, with fruits, pods and berries. It would be The Reynolds Wildlife Café & Retreat. I don’t know what I expected, but when I opened the box each potential tree was no larger than a 12” tall toothpick. Devoid of leaves and bark, there was no way of telling what they were — their tags had slipped to the bottom of the package. Would they ever really be trees? Everyone said no, they’d die off within a year. But I’m stubborn and was determined to have my wooded area, a haven for us and wildlife. We planted 75 sticks, watered well, crossed our fingers, let Nature take her course, and gave away the remaining 25 twigs. It’s now 10 years after that planting and we have a full-blown forest. Originally from a colder clime, we had no idea that trees would grow so fast in southern heat and humidity. Or that most of the trees chosen would defend themselves with lethal thorns, to protect their fruits. Not to mention that their limbs would sprout from the base up, unlike civilized city trees with exposed trunks to walk safely under. The dumb city kids have learned a lot of lessons, and each year sees us happier with our decision to become a little bit country. The extra work may keep us busy and sore, but it also keeps us young. 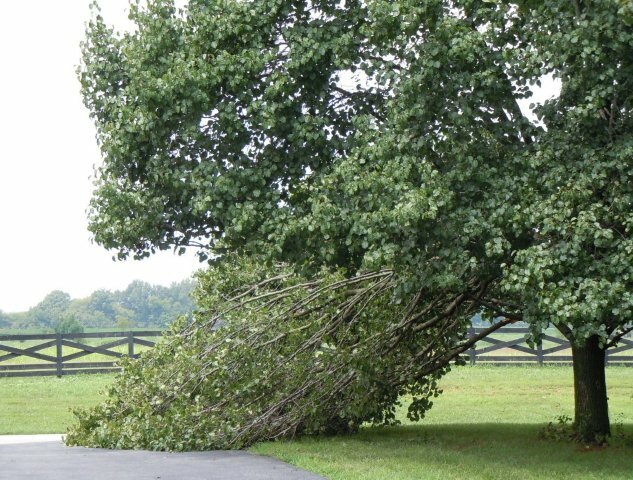 And we’ll be even younger tonight because an enormous branch of Bradford Pear has decided to take a nap on the driveway (photo above).